B.T.J.’s Jungle of West Islip, New York – your one-stop pet shop – offers a great selection of reptiles. Snakes, turtles and lizards, which include everything from bearded dragons to iguanas, are among our featured creatures. Whether you’re considering adding a reptile to your family or looking for reptile supplies such as food and habitats, B.T.J.’s Jungle is the place to go! 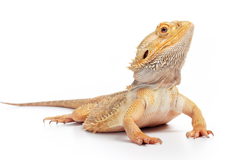 Our knowledgeable staff can help determine if a reptile is the right pet for your family. They can also help you decide on which type of reptile is the best fit and help guide you through the process of setting your reptile up to be comfortable in your home. To start out, you will need a comfortable, safe habitat for your reptile. Remember to consider the full size of your pet when selecting your habitat. That’s why B.T.J.’s reptile experts always recommend that you purchase a habitat that will accommodate your pet at its full, adult size. Our friendly staff is always on hand to help you decide on an appropriate size for the reptile you choose. We carry a vast selection of cages and aquariums for your reptile. Our top-rated brands that we carry include Zoo Med, Exo Terra and Zilla cages/terrariums. You will also need some supplies for your reptile, such as heaters, lights and décor. It’s important for pets to be in an environment as close to their natural habitat as possible. Trust our staff at B.T.J.’s Jungle because they have extensive experience with all kinds of reptiles. Our reptile experts will help you select the best looking and, more importantly, safest supplies that will make your reptile’s habitat feel as natural as possible. B.T.J.’s Jungle offers supplies by Zoo Med, JurassiPet, Exo Terra, Zilla, Rep-Cal, Nature Zone and Repashy. To keep your reptiles lively, active and happy throughout their lives, you will need to feed your pet a healthy diet. Not sure which type of food is right for your particular reptile? Don’t worry! Our staff is available to inform you about your reptile’s dietary needs and direct you to the type of food it needs. At B.T.J.’s we offer a wide range of healthy reptile food by such top-rated brands as Repashy, Zilla, Exo Terra and Zoo Med. Come down today and speak to one of our experienced B.T.J.’s Jungle staff members at our pet store conveniently located at 144 Sunrise Highway in West Islip. You can also call us with any questions you might have at 631-587-8191 or fill out our simple online contact form. We look forward to hearing from you soon!